The original, five thousand word, version of "Tom Chamberlain: 'My Brave Young Brother'" appeared in the April 1997 issue (no. 53) of Crossfire, the Journal of the American Civil War Round Table (UK). This latest expansion (December 6, 2004) is three times the length and contains material from unpublished primary sources. I am continuing my research with the aim eventually of having a booklet-length biography of Tom Chamberlain published; and of adding more new sections to the site. As far as I know, this essay is the only one ever written specifically about Tom, although The Chamberlains of Brewer (1998) by Diana Loski, from Thomas Publications, covers all of Joshua Lawrence Chamberlain's siblings, including Tom. Click on the "News and Reviews" link below for my review of this book. For further information on the American Civil War Round Table (UK) visit its web site. Also on my site is an article on John A. Oates, first published in Crossfire in 1999, but since expanded several times (most recently: June 25, 2006). Again, I believe this is the only essay ever written specifically on the subject. I'd be happy to receive any comments, additions or corrections. You can e-mail me on: pardos@globalnet.co.uk. Tom Chamberlain's grave at Castine, Maine. Photograph copyright (c) 1998 Phyllis Marshall Watson. and to a photograph also showing the headstone of his wife Delia (with the wording of the two inscriptions). The web site of the Pejepscot Historical Society, which runs the Chamberlain Museum in Brunswick, Maine, is sheer paradise for Joshua L. Chamberlain enthusiasts. Amongst many other things, it contains a descriptive inventory of JLC-related correspondence, and a mail-order section where one can buy all the in-print titles on Chamberlain and the 20th Maine (plus some fun gifts). A related site is that of Maine's Joshua L. Chamberlain Civil War Round Table (which is not only about JLC!). Also essential viewing is the Maine State Archives Civil War Page. The above photograph of Tom Chamberlain is from the latter's Maine officers cartes-de-visite collection. In addition, Chamberlain researchers will need to bookmark the important Joshua Lawrence Chamberlain Collection at Bowdoin College. Long-time friend of this site, Pat Finnegan, has her own web page, "To the Limits of the Soul's Ideal", a substantial and active site devoted to JLC. 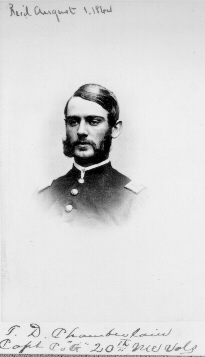 Click here for the text of one of Joshua L. Chamberlain's Gettysburg reports (on the Civil War Home site). And here for the text of his article "Through Blood and Fire at Gettysburg" (on the Gettysburg Discussion Group site). Courage on Little Round Top is a web site run by Thomas M. Eishen, author of the eponymous novel which mainly concerns Joshua L. Chamberlain and Robert Wicker of the 15th Alabama, but naturally also involves Tom Chamberlain. 20th Maine, Company G, based in Northern California, is a re-enactor unit named after Tom Chamberlain's Company. You can also follow links on its site to other 20th Maine re-enactors. Bedford and Janet Hayes (whose excellent photo-montage of the Tom Chamberlain material in their personal collection forms Page Three in the Photo Gallery here) run Gunsight Antiques, the web site of which is well worth visiting if you're at all interested in original Civil War antiques (whether to buy or just to admire!). Often their stock includes tempting Chamberlain items. For some links to bookshops and dealers see my Acknowledgements section. Other highly recommended sites are the American Civil War HomePage and the Dakota State University Civil War Home Page, which contain seemingly infinite numbers of useful links. I know the fact that this site is based in England surprises some of you, but there is actually a great deal of interest in the American Civil War here. Try the link to the ACWRT(UK) above, and for further proof, visit the exciting site of the American Civil War Society (UK), one of the leading re-enactor groups in this country. For my additional John Oates links, click here. Visit my site devoted to the Civil War career of another younger brother of a famous Civil War hero - Tom Custer. Last altered June 25, 2006. Copyright (c) 2006 Rosemary Pardoe. Nothing on this site is to be reproduced without permission.